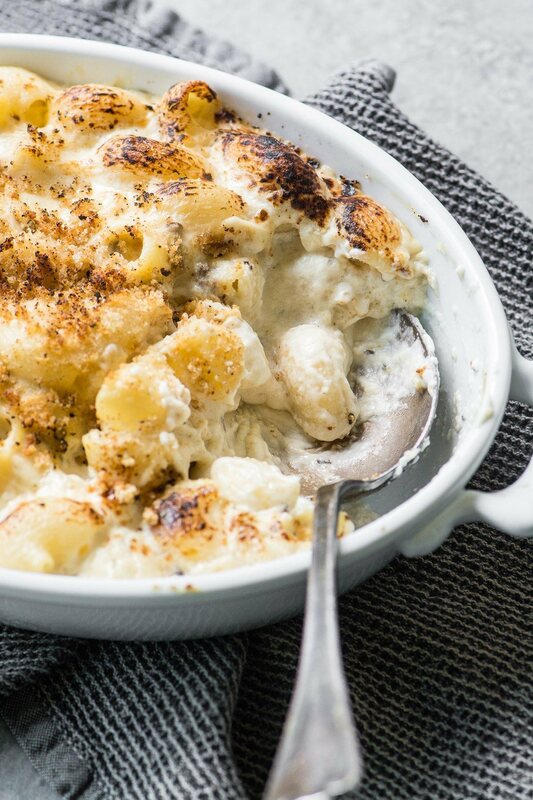 Truffle Mac and Cheese ~ a luxurious baked pasta with a rich creamy sauce and earthy flavor from truffled cheese, truffle oil, and a dash of truffle salt. Preheat oven to 325F. Lightly butter a gratin or other baking dish. In a dry saucepan sauté the chopped mushrooms, stirring almost constantly, until they lose their moisture and start to turn dark. Add the butter and flour and cook for a minute or two, but don't let it brown. Slowly add in the milk, cream, and evaporated milk, stirring to blend. Turn the heat up a bit and cook the mixture, stirring constantly, until it just comes to a simmer and thickens. Don't let it come to a boil. Take off the heat, add the truffle oil and salt, and let it cool for a minute. Add the cheeses and stir until the cheese is melted and the sauce is smooth. Fold in the cooked pasta and turn into your prepared pan. Moisten the breadcrumbs with truffle oil and add a pinch of truffle salt. I also add some fresh cracked pepper. Sprinkle the crumbs over the pasta. Cook the mac and cheese for about 20 minutes, or until bubbling. If you'd like a little more browning, run it under the broiler briefly, but watch it very carefully so it doesn't burn. Serve the mac and cheese immediately.